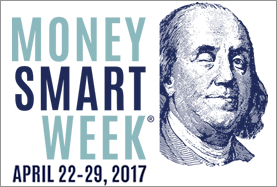 Money Smart Week (MSW) began with approximately 40 Chicago-area organizations working together to improve personal financial literacy in 2001. Zach S. Henderson Library participated in the fifteenth (its third) annual Money Smart Week in April with two panel events geared toward student financial success. The first panel, “The Empty Wallet Diaries: Everyday Stories and Practical Advice from the Inside,” consisted of upper classmen (and library student employees) Nigel Brown, Keyani Loftin, Joshua Johnson, and Miranda Swaim and was designed as an informal discussion for younger students to gain valuable insight from those who have gone before. The panelists shared everything they had learned, and everything they wish they had known, regarding budgeting, savings, banking, credit, debt, and student loans while attending college. The student audience was also given an opportunity to ask questions of the panelists. Documents Library Technical Assistant, Monica Van Wagenen served as moderator and shared savvy shopper tips throughout the event. Subway and Coke donated refreshments. The second panel, “You and Your Money: Who’s Using Who,” consisted of local experts in finance – bankers Shante Clesca, Shonda Wilkerson, and Coulten Hauser from Wells Fargo, Molly Sisson from Synovus Securities at Sea Island Bank, and Georgia Southern finance professor, Dr. Allissa Lee. This panel served to formally advise students of the need to take control of their finances now as they are starting out on their own. All of the panelists emphasized the need for students to educate themselves about how their financial choices regarding debt, credit, and savings will not only affect them now but far into the future. It is a huge misconception among underclassmen students that they will make a fortune right out of college, so they can spend today, borrowing from themselves tomorrow. Quite the contrary, the students learned that it is never too early to invest in their own retirement. The feedback was very positive and indicated that students are eager to learn about finances but might not know how or where to look for guidance on how to create successful financial futures. Money Smart Week provides the opportunity to have these vital discussions. Due to the enthusiastic feedback, the Money Smart week team at the library has decided to do similar events for next year, with the addition of an event for faculty, staff, friends of the library, and the general community. We hope to see you there! Great job and special thanks to Monica Van Wagenen, Jessica Williams, Jermaine Bryant, and Lori Gwinett.